In his new novel The Good Life Elsewhere Moldovan writer Vladimir Lorchenkov tells the story of a group of villagers and their tragicomic efforts, against all odds and at any cost, to emigrate to Italy for work. All together, at the same time. 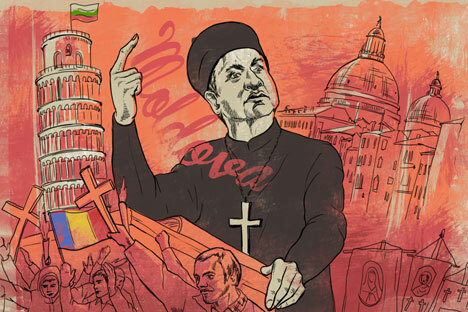 In Lorchenkov’s uproarious tale, an Orthodox priest is deserted by his wife for an art-dealing atheist; a mechanic redesigns his tractor for travel by air and sea; thousands of villagers take to the road on a modern-day religious crusade to make it to the promised land of Italy; meanwhile, politicians remain politicians. A country where 25 percent of its population works abroad, where alcohol consumption per capita is the highest in the world – this is a country that surely has its problems. But, as Lorchenkov vividly shows, it’s a country whose residents don’t easily give up. RBTH presents an excerpt from the funny and tragic The Good Life Elsewhere. Translated from Russian by Ross Ufberg, the book is out February 18 in New Vessel Press. In the fall of 2003, the Moldovan priest of the village of Larga, Father Paisii, announced the First Holy Crusade of Eastern Orthodox Christians to the unclean land of Italy. The reasons rousing the priest to this desperate act were many. But most important among them, as usual, was a lack of money. Father Paisii understood that he’d never see Italy if he had to raise the funds himself to get there. A village priest in a godforsaken parish doesn’t have a shot at collecting four thousand euros. And since he couldn’t pay his way to Italy, Father Paisii decided he’d have to make his way there at the head of Christ’s Army. He’d read about the Crusades in seminary, where he’d been a solid C student. This decision worthy of Solomon’s name came to Father Paisii not after a long discussion—he had no great love for long discussions—but in the middle of a sermon. The decision was lucid, immediate, and brief. Like a blaze, or a holy prophecy. Father Paisii was delivering a sermon about Italy. The parishioners listened to Father Paisii, who had fallen into an open-mouthed rage. The priest’s sermon was becoming more and more apocalyptic. The sermon was becoming more lucid and forthright. The parishioners, mouths still hanging open in amazement, began to understand what the priest was driving at. Many of them were starting to view Father Paisii with approval. “Seize everything from the impious and give it to the pious!” The phrase rang out through the church. Timid applause broke out from somewhere. Father Paisii wrinkled his brow, cleared his throat and took a sip of dark wine from the gilded plastic chalice. His throat felt stuffed with cotton. The wine was dark, not because it was pressed from dark grapes. It was all because of the dust and the parishioners who couldn’t pay for the services of a cleaning lady in the church. “That’s why the place is a pigsty,” the priest thought to himself angrily. The parishioners once again grew bored. Paisii realized with relief that they didn’t want him to quote more holy books, they wanted a call to action. He changed the format of his speech. White from worry, his nostrils trembling, Father Paisii waited until the ovation was finished and raised his hand again. From a corner of the church the video camera for the local television station started recording. “This is alright,” thought Paisii and waited for the red light to come on before talking. “Verily!” they answered in the church, the golden flames of their candles growing fuzzy before Paisii’s eyes. The far-off shouts of the crowd mixed into one regular rumble. Later, Father Paisii fearfully admitted in his heart that amongst the howls and the noise he clearly heard somebody’s subdued shout, “Goal!” He even heard somebody emit a cheer for the Chisinau soccer team. The one thing Paisii, grandson of a Jew, did not hear was a cry of “Kill the Jews!” He let out a sigh of relief. At six in the morning, Paisii had somewhat recovered from the dark wine in the plastic chalice and was tormented by thoughts of the future shame this day would bring him. At seven, waking up for good, Paisii rubbed his eyes a minute, went out into the yard and smiled awkwardly and confusedly. The priest was in shock. Surrounding his house was a well-armed crowd, heaving, holding their religious banners. There were seventy-five thousand people from across Moldova. Upon catching sight of Father Paisii, the crowd applauded. Old Man Tudor brought Paisii his little horsie and hefted him up onto the saddle. As if watching a sporting event at a stadium, the crowd gave him a real welcome: they did the wave. The priest sensed another, warm type of wave, one which swelled up through his breast to his heart and which he couldn’t hold back. His tears were warm as a mother’s hands.